As part of the Getty initiative Pacific Standard Time: Art in L.A. 1945-1980, The GRAMMY Museum, along with the Museum of Latin American Art (MOLAA), is proud to present one of the most powerful and soulful voices in music today, vocalist Little Willie G, for an intimate discussion and performance. One of the most iconic voices of the Eastside Sound, Little Willie G has also dedicated his life to helping youth and families at risk. 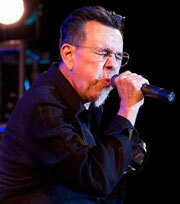 Having begun his career in the mid-60s as lead singer for Thee Midniters, the legendary R&B group from Los Angeles, Little Willie G quickly became known for his iconic and charismatic stage presence, and helped Thee Midniters become one of the first Chicano rock bands to have a hit in the United States. Hear Little Willie G discuss his five decade career and his commitment to spread a message of hope and love through music. After the interview, moderated by Josh Kun curator of the PST/GRAMMY Museum exhibition Trouble in Paradise: Music and Los Angeles 1945-75 and professor in USC's Annenberg School for Communication and Journalism, Little Willie G will take audience questions and will perform a selection of songs.